Whilst Risk Appetite deals with the level of risk that the organisation will pursue to meet their organisational objectives, Risk Tolerance defines the upper and lower levels that an organisation is able to deal with / absorb, without significantly impacting the achievement of the strategic objectives. Tolerance levels can be graphically represented alongside the appetite levels on what is referred to as a risk matrix or heat map taking into account the Impact (Consequence) x Likelihood of the risk. The example below shows the appetite line, above and to the right of which performance is deemed to be sub-optimal and action should be taken. In many cases, organisations state the financial impact in absolute values (i.e. Rand based) using risk threshold values (appetite) which are applicable at a group level but not at a regional, divisional, business unit level. For example, the financial risk value of R1,000,000 may be ‘Insignificant’ (rating 1) at the group level but may be ‘Critical’ (rating 5) to a smaller business unit. A better approach is to set specific risk impact models for each level of the organisation so that financial risk impact values are relevant at the lower levels of the organisation. Alternatively the financial scale could be based on % of Turnover (T/O) but this will only work where you know the turnover / materiality per business unit. When rating the overall impact for a risk, the risk owner would use the worst (most impactful) rating across all impact rating categories. The risk owner would rate the impact of the risk as a 5 (i.e. the highest value which happens to be ‘Legal’). 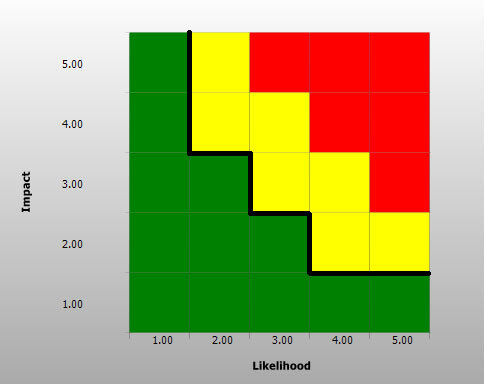 Based on our risk impact appetite model (Figure 2) and the likelihood ratings (Figure 3), we are able to rate all risks qualitatively (impact and likelihood) and map them on our heat map against our risk appetite. The heat map in Figure 4 shows risks across multiple business units mapped against our risk appetite. Where possible, we should also rate our risks quantitatively, albeit that some risks such as ‘reputational risks’ may be difficult to quantify. The nice thing about quantifying risks is that it make aggregation across business units relatively simple. (a) In the example above (Figure 5), the aggregated risk value of R0 to R750,000 is green, R750,000 to R950,000 is yellow and above R950,000 is red. The aggregated value is derived from the sum of all risks for the unit you are working on and all child units below this unit. 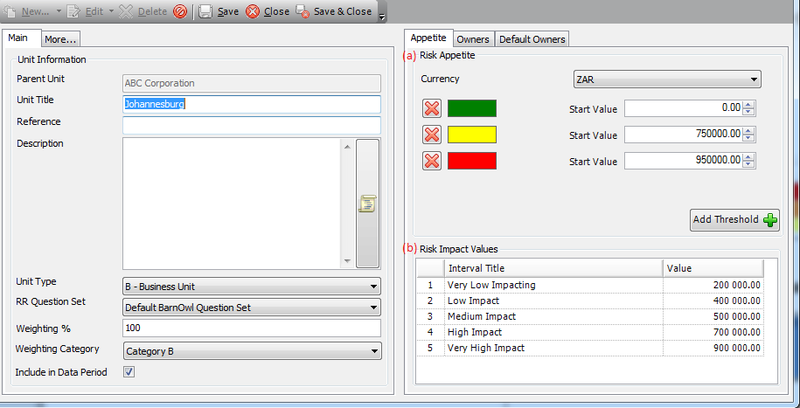 (b) In the example above (Figure 5), the risk impact values relate to each risk within the unit you are working on. It’s one thing to plot all your risks (across different business units) on a heat map as shown in Figure 4, or to show the average of all your risk ratings by category of risk. However, neither of these two methods take into account the significance of the each business unit within your organisation. How do we ensure that a risk which is ‘critical’ in a small business unit does not end up as a ‘critical’ risk at the group or regional level (unless required)? One way is to weight each business unit and apply this weighting when calculating the qualitative risk rating. The problem with this approach is that it is very difficult to set weightings per business unit especially where your organsational hierarchy runs into the 1000s of business units. The heat map in Figure 6 takes into account the ‘significance’ of the various business units. On point 1 in the heat map, we see that the risk ‘03. Accountability of goods not accepted by the customer’ is plotted as a ‘yellow’ risk (Unacceptable, Category B business unit) even though in the detailed grid below it is rated as 25 (i.e. a red risk in its own business unit: Johannesburg > Finance). On point 4 on the heat map, we see that the risk ‘Noncompliance GNR 0924 of 3’ is plotted as a ‘red’ risk (Serious, Category A business unit) even though in the detailed grid below it is rated as 16 which is lower than the risk ‘03. Accountability of goods not accepted by the customer’ with a rating of 25. It is relatively simple to aggregate the Rand value of risks at any and all levels of the organisation and map them to our risk appetite thresholds specified at each level of the organisation as illustrated in Figure 7. Step 1: Understand the definition of risk appetite and tolerance and how it relates to your organisation. 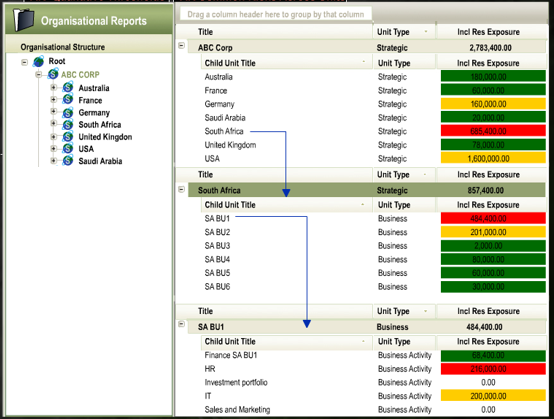 Step 2: (a) Formulate and rate risks based on your qualitative risk appetite model / statement. Define risk appetite model/s that take into account materiality at group, divisional and business unit level (b) set up your quantitative risk appetite thresholds at key levels (units) of your organsational. Step 3: Report qualitatively as well as quantitatively on your risks, taking into account the significance (importance) of the different units within your organsational. 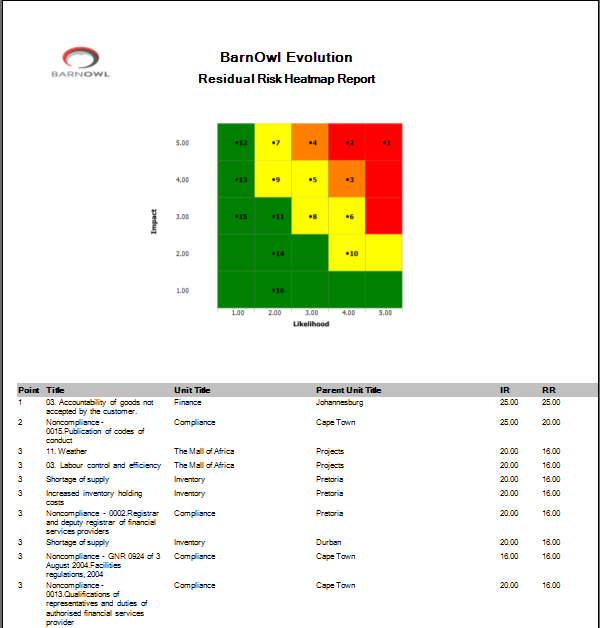 BarnOwl is a fully integrated governance, risk management, compliance and audit software solution used by over 200 organisations in Africa, Europe and the UK. 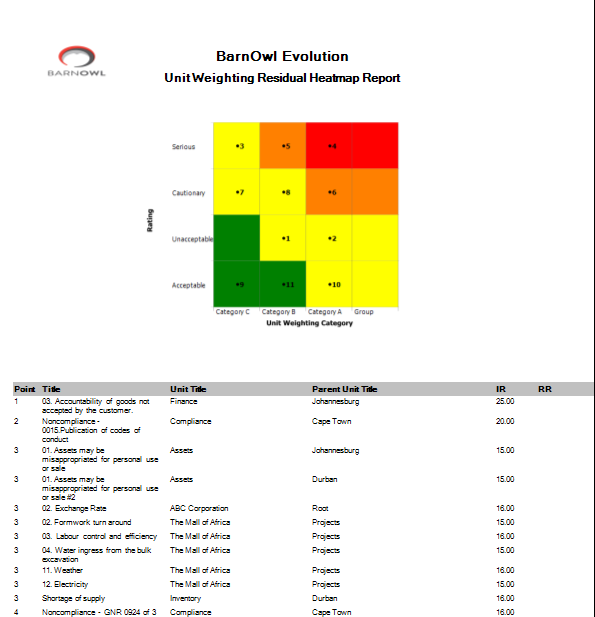 BarnOwl supports best-practice risk management, compliance and audit frameworks (e.g. COSO, ISO31000, Compliance Institute’s Handbook, International Professional Practice Framework) while offering a highly flexible and configurable parameter-driven system, allowing you to configure BarnOwl to meet your specific requirements.